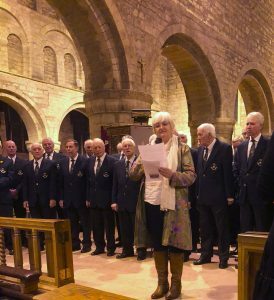 Blog Hereford Police Male Choir March 30th 2019 - thank you! On Saturday 30th March 2019 we had an amazing event at the Priory Church in Leominster. There was a wonderful programme put on by Hereford Police Male Choir which made us laugh and cry and was totally in keeping with the ethos of our Meeting Centre. Thank you to the musical director Alison Houlebrooke; the accompanist James Macdowell-Scott and the soloists. We would also like to thank the Priory Church, staff and helpers from The Earl Mortimer College and the audience for coming and supporting. Finally, not least thanks to Fred and Anne Jeanes who made this all possible. The event raised £ 1,094 which is a wonderful achievement and will contribute significantly to the running of our Meeting Centre.